"The barn is well over 400 years old. Although it is difficult to be precise, it was probably built by Henry Clifford (Rector 1569-1616). A tithe barn certainly stood on much the same site some time before, a description of 1459 noting, "a great barn with a little square exit and entrance". Such barns were built in the days when all landowners, however small their holding, were required to deliver to the church a tenth of all their crops (fish, fowl, timber etc. were included in the tithing). The corn was stacked in the barn for winter threshing. The massive double doors stand opposite each other to permit the passage of laden carts at harvest and then allow the wind to carry away the chaff during threshing and winnowing. The tithing requirement ceased with the Tithing Commutation Act of 1836. In recent times the barn became a repository for ageing farm implements and fell into disrepair. In 1975 the Landbeach Society raised the necessary funds to carry out restoration. The ownership of the barn continued to be vested in the Diocese of Ely until it was purchased by South Cambridgeshire District Council for use by the village under the auspices of the Landbeach Society. *Whilst at the barn it is worth noting the mounds and dips in the Common to the north east which represent all that remains of the canal system and the great earthworks of the Manor of Chamberlains." Reproduced, with permission, from Historical Landbeach. 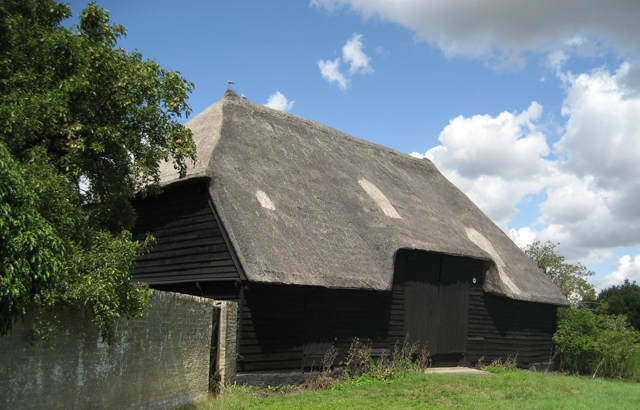 For information on efforts to restore the barn since 2014, see Friends of Landbeach Tithe Barn.